Seoul Semiconductor, a global innovator of LED products and technology, announced on March 23rd that its SunLike Series natural spectrum LED product won the Gold Award at the Elektronik Product of the Year 2018 Awards, hosted by Elektronik (http://www.elektroniknet.de), a leading German electronics publication. As a publication specializing in electrical and electronic components, “Elektronik” is a prestigious magazine with an illustrious history and the largest number of subscribers in Germany. Over the past 20 years, they have conducted annual surveys among their subscribers to find the “most creative and innovative products.” Based on these survey results, Elektronik selects the top product that with the most impact in its corresponding field, and confers the awards accordingly. This year, SunLike Series natural spectrum LEDs were selected as the best product in the “Optoelectronics” field, in competition with Ceramos C product by Osram Opto and XHP70.2 by Cree. 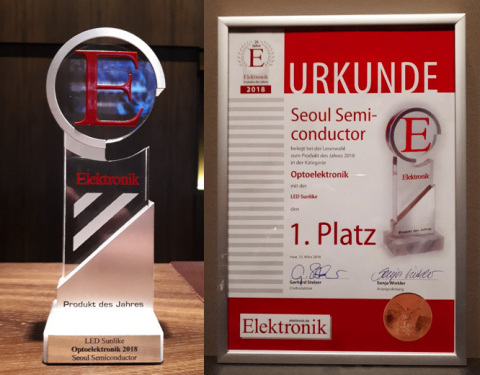 This is second time that Seoul Semiconductor has won the Product of the Year Award from Elektronik, since the company’s Acrich technology won the award in 2007. SunLike Series natural spectrum LEDs were developed by Seoul Semiconductor and Toshiba Materials to produce light with that closely matches the spectrum of natural sunlight. SunLike Series LEDs show the color of objects as they would appear in natural sunlight. Generally, oversaturation of blue light in a certain wavelength may cause light reflection; however, the light produced by SunLike LEDs closely matched that of natural sunlight, so it enables users to view text and objects more clearly while also helping to maintain healthy human biorhythms. Due to their close match to the spectrum of natural sunlight, SunLike LED technology produces light with superior color quality compared with conventional. Traditionally, artificial lighting has applied a color rendering index (CRI) that evaluates color quality based on fluorescent lamps. However, as LED technology has advanced, it has exceeded the color quality of fluorescent lamps, and as a result, new standards of color quality (CQS) are being developed. In particular, if existing CRI (color rendering) is understood in terms of mechanical colors used for experiments and measurements, CQS is characterized by the expression of more natural colors as they are perceived by the human eye. In case of conventional LEDs, their color rendering is high, but their CQS is low. Light produced by SunLike LEDs can achieve the best color quality in both color standards, with a rating that exceeds 95% for both CRI and CQS. Also, SunLike Series LEDs represent the next generation of natural light sources, having achieved a higher level of eye safety certification than any other LEDs – recently recognized by the International Commission on Illumination as a light source with no photobiological risks. Materials. The combination of Seoul Semiconductor’s optical semiconductor technology and Toshiba Materials’ TRI-R technology produces light that closely matches the spectrum of natural sunlight. TRI-R is a registered trademark of Toshiba Material Co., Ltd.